Under The Horse Passport (England) Regulations that came into effect in July 2009, it is a legal requirement for every equine to have a passport. The regulations were introduced to ensure that animals that are not intended for human consumption can be identified and can benefit from the use of medicinal treatments that are banned for use in food producing animals, such as Phenylbutazone, commonly known as ‘bute’. Horses are considered to be food producing animals unless they are declared as NOT INTENDED FOR HUMAN CONSUMPTION by signing the appropriate part of SECTION IX in the passport. If the horse IS intended for human consumption or SECTION IX is not signed it is a legal requirement for you to record the medicines administered to your horse and the passport must be presented at the time of treatment. It is now compulsory to have your horse microchipped when applying for a passport. The chip must be implanted by a registered veterinary surgeon. Freeze branding and DNA verification do not replace the requirement for a microchip. All horses must have a passport by the 31st of December of the year of their birth or by 6 months after birth, whichever is the later. Where the passport has not been applied for within the required time limits, the animal will automatically be signed out of the human food chain. When a horse is sold, the owner must give the passport to the buyer at the time of the sale (sale includes transfer of ownership). The buyer must notify the issuing Passport Issuing Office (note this may be based in another EU member state) to register the new ownership within 30 days. There is no exemption for dealers that sell a horse within 30 days of purchasing it. The initial foal registration deadline is 31st July within the year of birth. An FEI passport is mandatory for horses competing at most international FEI sanctioned events. If you are planning on competing at an FEI event and your horse requires an FEI passport, please contact your discipline directly for information on how to apply. Be aware that most disciplines require at least 6 weeks notice in advance before they can issue a passport. 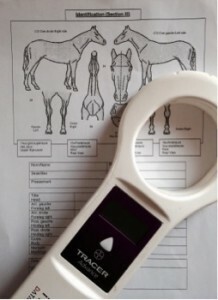 From January 2013, all horses applying for an FEI passport must be microchipped.